Christmas day at the North Pole is dark. In Inuit Nunangat, the Inuit homelands of Canada, the Arctic Circle (66.6 degrees), marks the latitude where the noon sun is just visible on December 21st, the northern winter solstice. The sun rises above the horizon for about 2 hours. On Christmas day in Iqaluit, day length will be 4 hours and 22 minutes. Arctic regions can be defined in different ways. While some of Canada’s Inuit regions lie below the Arctic Circle, they mostly all lie above the treeline of Canada’s boreal forest biome. The word, Inuit, means “the people”, and Inuit Nunangat is a Canadian Inuit term that “includes land, water, and ice”. 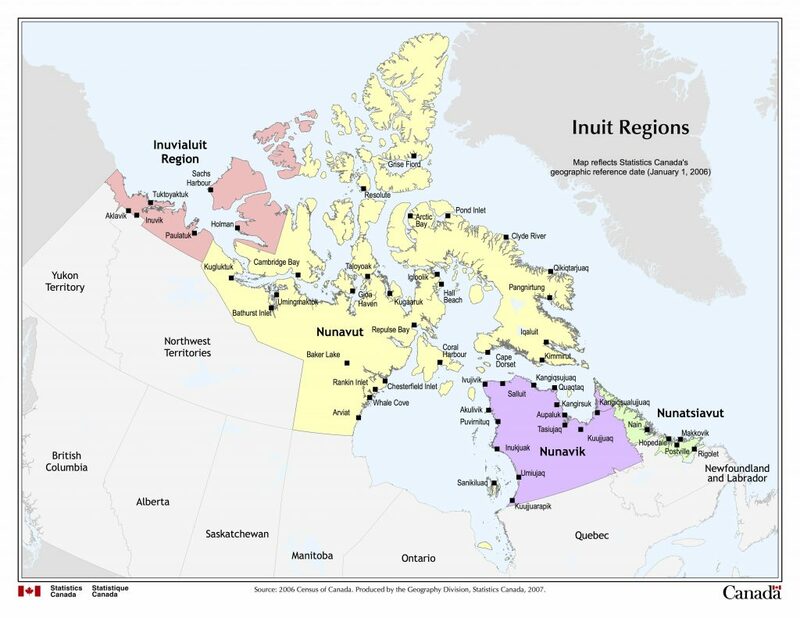 The four Inuit regions of Canada are the Inuvialuit Settlement Region, Nunavut, Nunavik and Nunutsiavut. If you are lucky enough to visit any of them, you will find yourself in low arctic tundra or high arctic polar desert. How is Christmas celebrated in communities with no bushes taller than 3-4 feet? If it’s close enough, you can travel to the treeline for your Christmas tree! Elsewhere, conifers are flown in to communities and command exorbitant prices. For the Inuit, three local plant groups are much more important in the dark, arctic winter than Christmas trees: the cottony seed heads of arctic willows, Salix spp. arctic cotton grass, Eriophorum spp. and mosses. These plants are gathered in late summer, dried and combined to make the wicks of the traditional qulliq (pronounced, kudlik) stone lamps. Traditionally fuelled by seal oil or blubber, the qulliq has provided light and heat in snowhouses, and other dwellings, for thousands of years. In Nunavut, the Inuktitut word for arctic cottongrass seed heads is pualunnguat. Suputit is gathered from fluffy, mature arctic willow flowers. 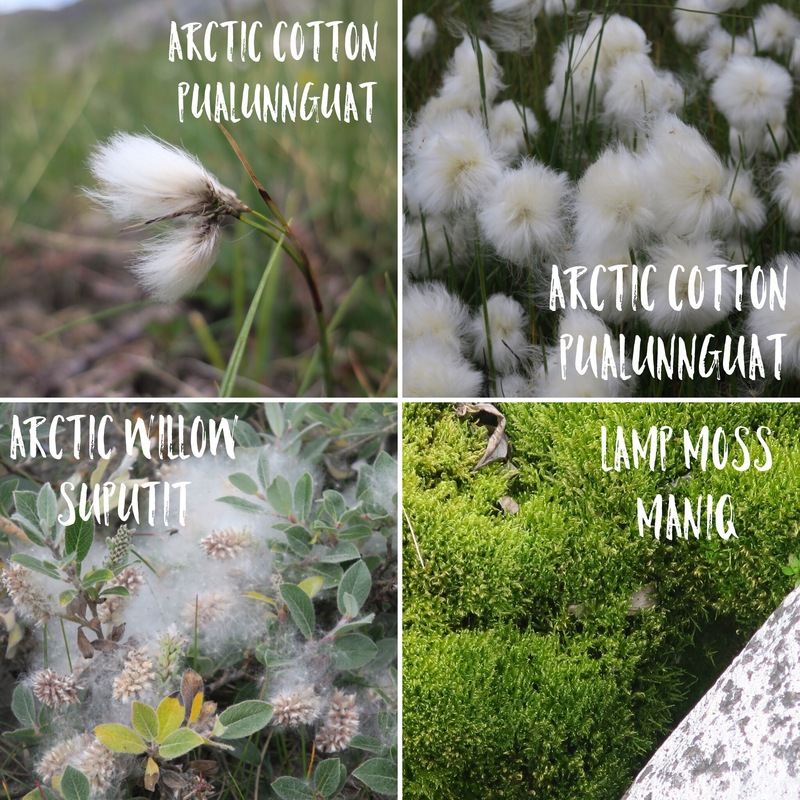 Once the seeds are removed, either arctic willow or arctic cotton can be mixed in equal quantities with lamp moss or maniq (Ziegler et al. 2009). Since there are many moss species in the arctic, it’s likely that more than one species of moss is be collected and dried for maniq, depending on location. Myna Ishulutak, seen here, is a language teacher and filmmaker who grew up on the land outside Pangnirtung. 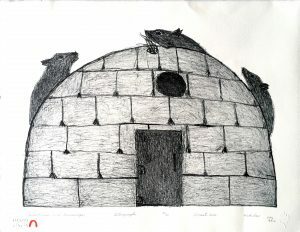 Like many Inuit, Myna is active in preserving her culture. Since 1985 the Nunavut Sivuniksavut college programme has educated youth from Nunavut about the their land claim and culture. There are plans to extend the programme to Inuit youth from across Canada. As well, concerted efforts to document traditional knowledge about plants have led to projects between Inuit elders and ethnobotanists, across Canada (Bandringa et al. 2010, Cuerrier et al. 2011, Ziegler et al. 2009). I recently learned that a new edition of the delightful children’s book, Walking with Aalasi, currently out of print, is being issued by publisher, Inhabit Media, in February 2018. 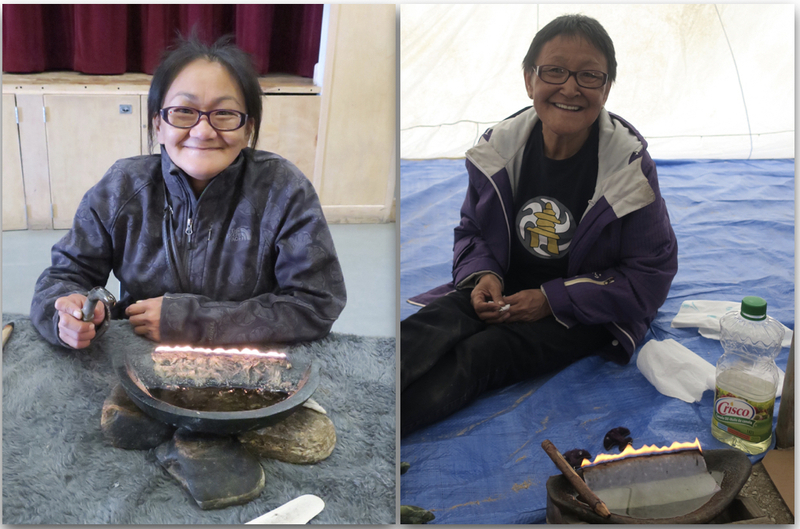 Elder, Aalasi Joamie, and her co-authors, explain in clear, accessible language, all about how she learned to use arctic plants. I don’t normally plug books, but my copy of this small book is dog-eared. There is a wonderful study-guide, free to download, for teachers. My Inuk friends and colleagues are resilient and resourceful. 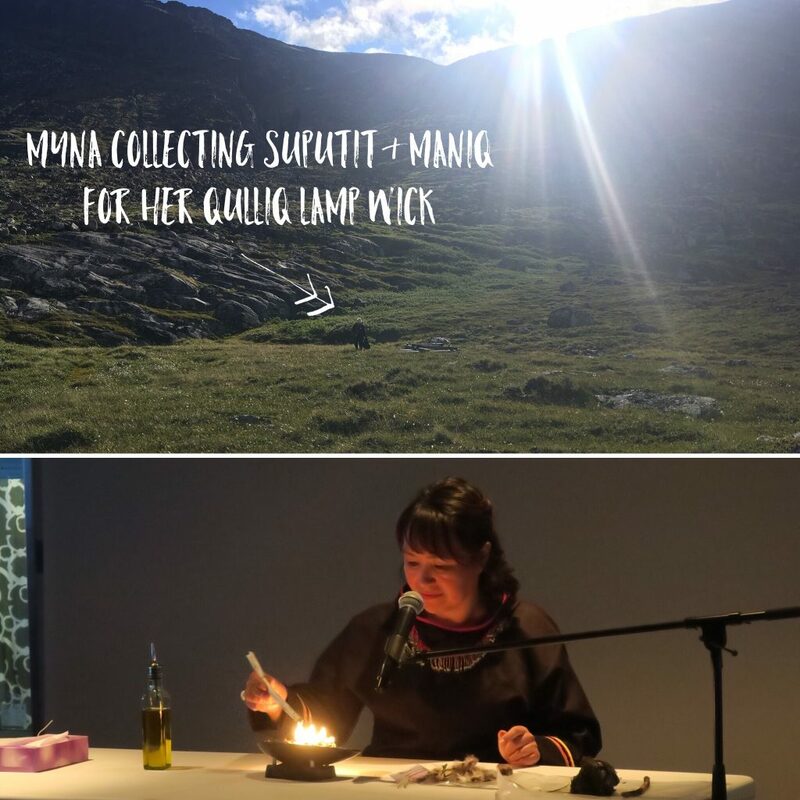 This past summer, as we travelled together as staff on an eco-tourism trip in the Canadian arctic, Myna discovered that supplies of maniq and suputit for her upcoming qulliq lighting ceremony were low. We discussed various solutions. Myna preferred not to go the creative Crisco and paper towel route for lighting the qulliq, that we were to encounter when we visited Cape Dorset. So, she collected arctic willow and moss, sandwiched them between paper towels, and rapidly dried them with a hairdryer! Her lighting ceremony (above) went off without a hitch! Canada’s Inuit are facing a warming world (Watt-Cloutier 2015). They are adapting, with one foot firmly planted in the modern world, while maintaining strong links to their culture, history and language. Bandringa, R.W. and Inuvialit Elders. 2010. Inuvialuit Nautchiangit: relationships between plants and people. Inuvialuit Cultural Resource Centre, Inuvik, Northwest Territories, Canada. Cuerrier, Alain and The Elders. 2011. The Botanical Knowledge of the Inuit of Kangiqsualujjaq, Nunavik. Avataq Cultural Institute, Westmount, Quebec, Canada. Watt-Cloutier, S. 2015. The Right to be Cold: One Woman’s Story of Protecting Her Culture, the Arctic and the Whole Planet. Allen Lane, Penguin, Toronto, Canada. Ziegler, A., Joamie, A. and Hainnu, R. 2009. 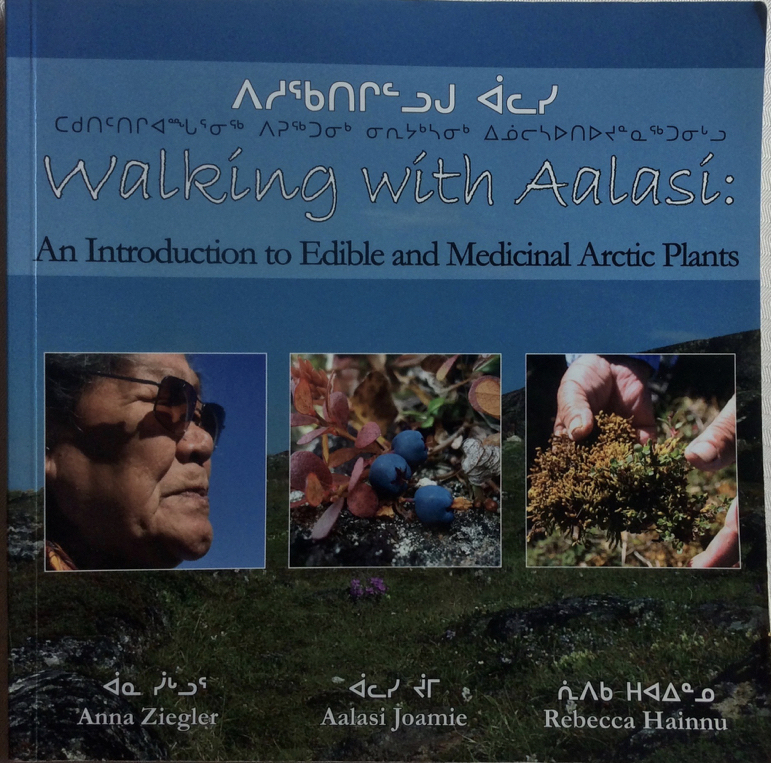 Walking with Aalasi: An Introduction to Edible and Medicinal Arctic Plants. Inhabit Media, Nunavut, Canada. This entry was posted in Advent, Herbarium RNG, Public Engagement with Science and tagged #AdventBotany, Dawn Bazely. Bookmark the permalink.